Some videos of the GUI that I developed for Brigade 2, showing real-time changing of materials with simultaneous animation and physics simulation. The GUI is still a work in progress, but being able to tweak any material on the fly is so much more easy to get the look right. The Ogre (model from here) is just simply rotating for now. 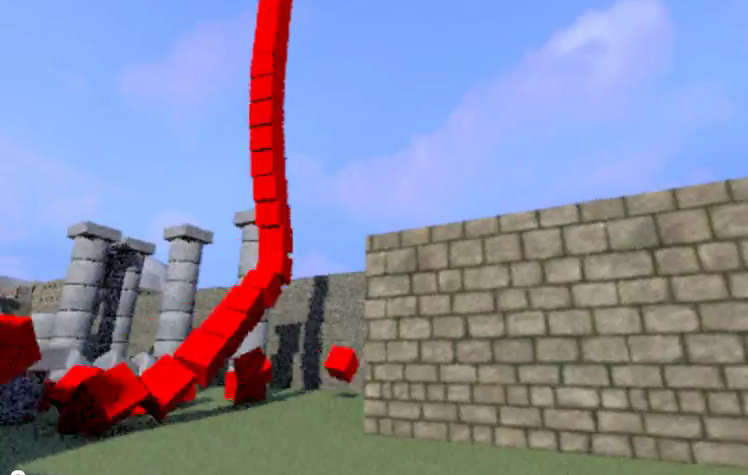 The mesh consists of 51k triangles of which the BVH is dynamically updated every frame (as are the BVHs of the car and the stack of blocks which are physics driven). I've been working on a IMGUI (immediate mode GUI) for Brigade 2 based on SDL, which is working pretty well and is quite responsive when the framerate is more than 5 fps. There are sliders for specularity, transparency and RGB values of the diffuse color of the material. Every material in the scene can be picked and updates in real-time + you can navigate the scene, control the vehicle and let a physics simulation run, all simultaneously while chaning materials. I will upload an executable demo and some videos of the GUI in action tomorrow. 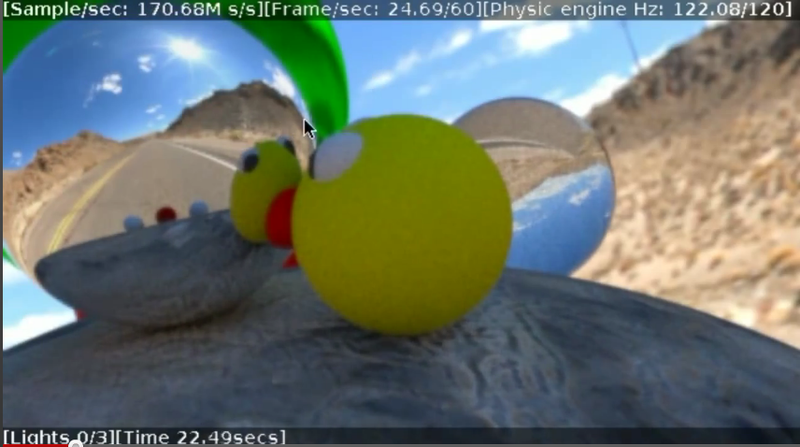 Paper + video of "Real-time bidirectional path tracing via rasterization"
It looks pretty damn good and the technique seems to be a very likely candidate for implementation in next-gen games because it fully exploits the rasterization hardware. 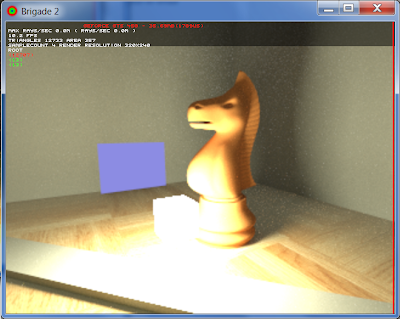 One of the limitations (as mentioned in the paper) is that it doesn't work well for highly glossy and perfectly specular surfaces (sharp reflections) for which ray tracing is proposed as an alternative. 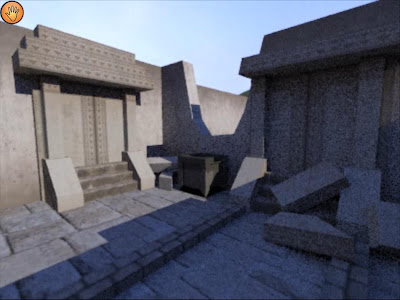 The title reminds me of "High-quality global illumination rendering using rasterization" by Toshiya Hachisuka from 2005, which described a technique to obtain photorealistic images on a typical 2005 GPU (like the Radeon 9700) in mere seconds, extremely impressive for that time. Shinji Ogaki is also a co-author on the Progressive Photon Mapping paper by Hachisuka and Jensen, so this new paper is definitely going to be interesting. 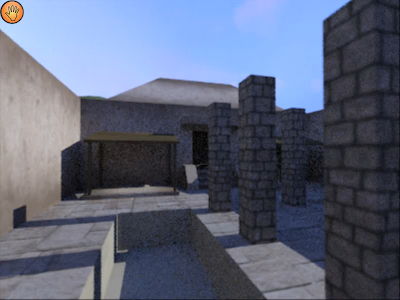 7 high-quality light maps are rendered in 181 seconds with NVIDIA GeForce GTX 580. 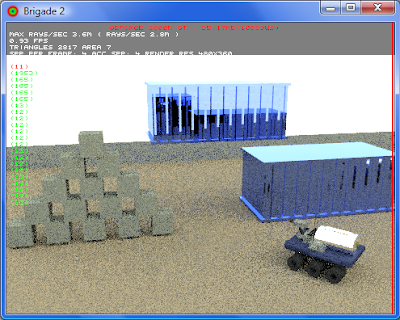 The resolution of ray-bundle is 2048x2048 pixels, and 10000 directions are sampled. 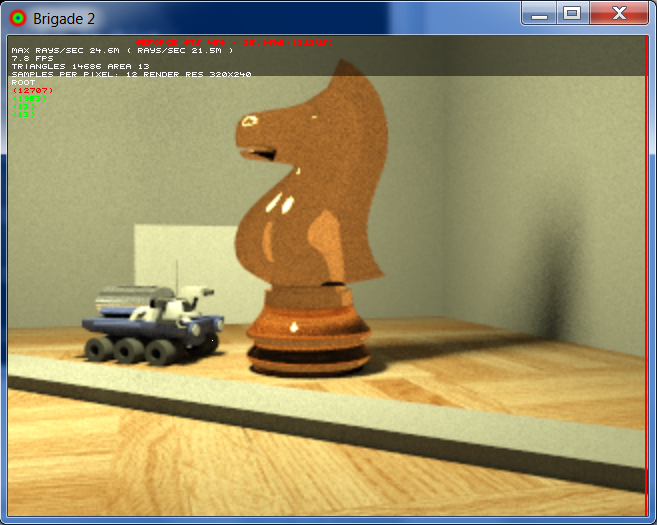 The performance of our renderer is over 200 M rays per second on a commodity GPU. Assuming everything scales linearly, this means that it would take about 16 milliseconds (60 fps) on a GTX 580 to compute a GI lightmap with ray bundles of 512x512 pixels and 100 ray bundle directions (= 100 directional samples) which should still yield great quality real-time global illumination. 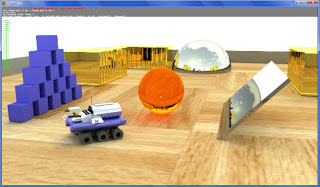 This tech could potentially be used for making real-time photorealistic games on current GPUs. 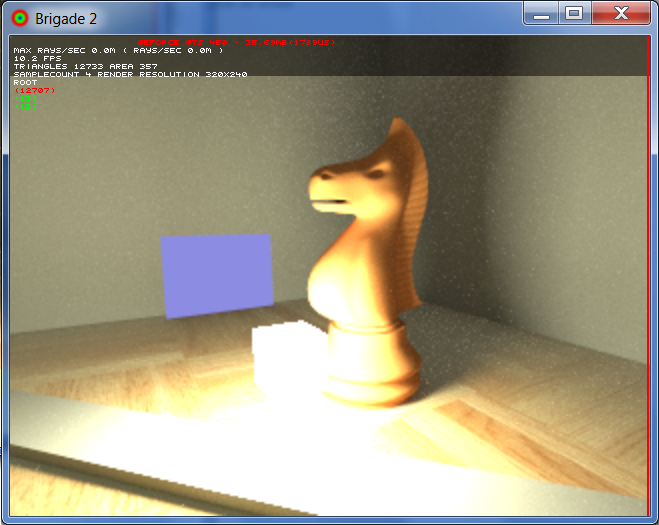 It doesn't work however for objects with highly glossy and perfectly specular materials. 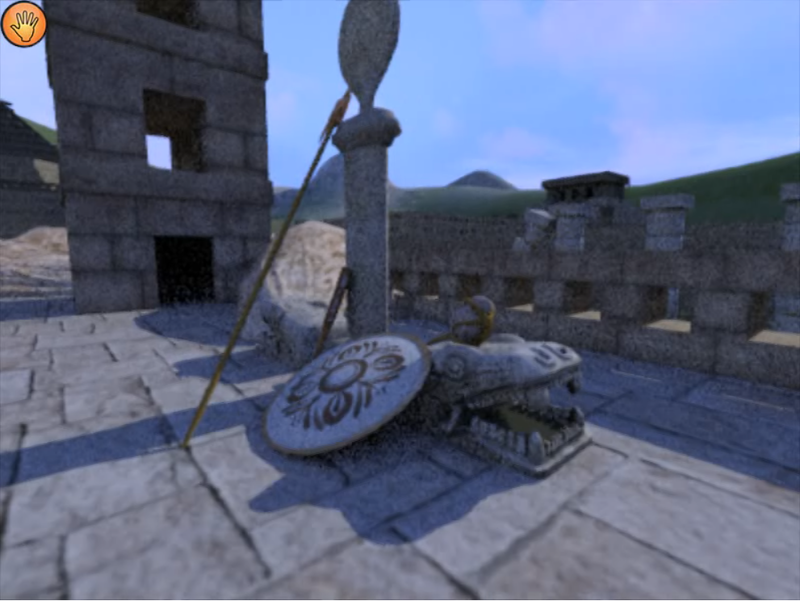 Some screenshots of a new Brigade 2 powered demo that I'm working on (rendered with a 8600M GT at 640x360). The floor is textured and slightly glossy and almost every object in the scene is fully or partially specular e.g. the blue boxes in the stack and the wheels and body of the vehicle now have a plastic look. The scene looks great in motion. Videos on a GTS 450 will follow tomorrow. The following videos demonstrate some Bullet physics tests that I've been working on and which were rendered in real-time with the Brigade 2 path tracer on a GeForce GTS 450. 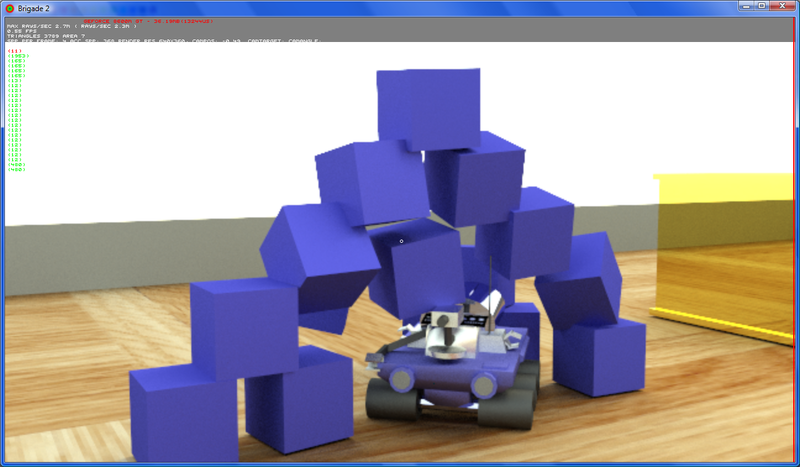 All the rendering is pure GPU path tracing with CUDA, the CPU doesn't take part in the rendering process except for recalculating the dynamic BVH of the car and the boxes every frame. All the light in the scene is coming from a skydome. The code for the car physics is essentially the same as what was used in the "Unbiased Stunt Racer" demo. 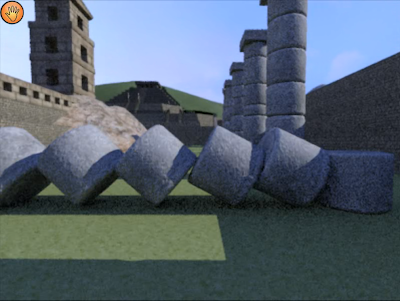 The physics simulation can be paused and resumed and the image converges (extremely fast) when nothing moves (physics simulation paused + stationary camera). There is also a short demo of a work-in-progress material UI (only diffuse to glossy/specular for now, the final version will have sliders for transparency, specularity, diffuse color and emissive color). 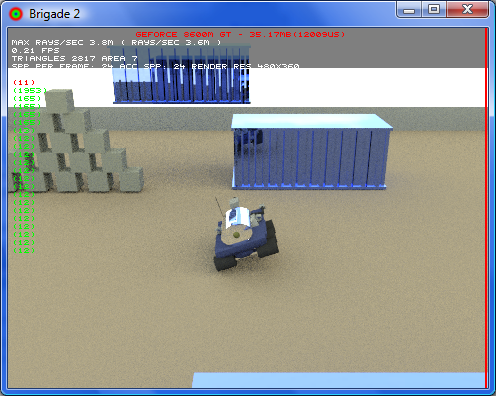 During the last several days, I have been working on implementing vehicle physics in a new simple demo that uses the Brigade 2 path tracer. 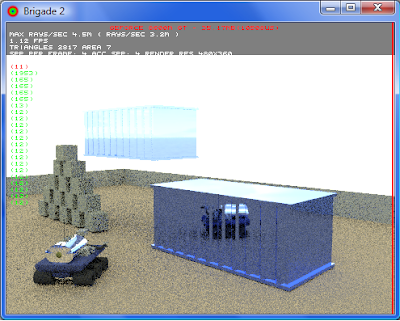 The scene in the demo is only lit by a sky texture and consists of a vehicle with mass, a few perfectly specular containers and a stack of boxes (more than 2800 triangles in total). The maximum path depth is 4 to make the reflections more interesting. The following screenshots and videos were all rendered in real-time on a mobile GPU, the 8600M GT, which is extremely low-end by today's standards and is about 30 times slower than a GTX 580. 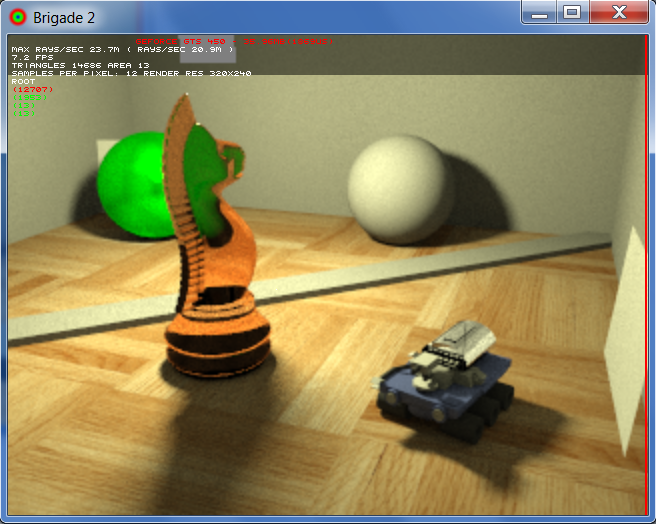 Nevertheless, despite its very low "CUDA core" count and clocks, it can still produce some pretty amazing footage, path-traced in real-time at 4 samples per pixel and a max path depth of 4 (allowing for reflections of reflections). Better videos with much higher framerate (captured on a GTS 450) will follow soon. 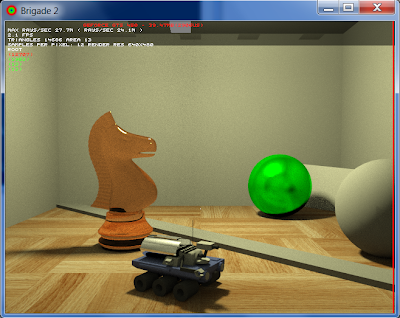 Sfera, the first real-time path traced game based on OpenCL! 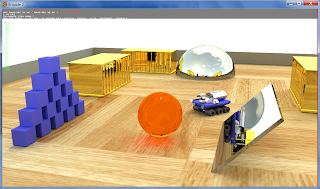 This is very cool: there is a new game called Sfera, it's using only spheres and is rendered with real-time path tracing on the GPU and CPU using OpenCL. The developer of the game, Dade (David Bucciarelli), is a LuxRender developer who is the first to make a working implementation of OpenCL-based unbiased path tracing on ATI cards. He created SmallptGPU, SmallLuxGPU and LuxRays. The demo features HDR image based lighting, bump mapping, multiple physically accurate materials, Bullet physics and multi-GPU support. I think it is absolutely awesome to see more developers using the power of the GPU (I'm glad that this time OpenCL and GPUs from ATI are used) to create amazing looking simple games with real-time photorealistic lighting. This game is a very nice proof-of-concept to show that real-time photorealism is very close. I hope this is the beginning of a paradigm shift for game graphics from rasterization to real-time ray tracing. The code is also open source and can be found at http://code.google.com/p/sfera/ (includes executables for Windows and Linux). 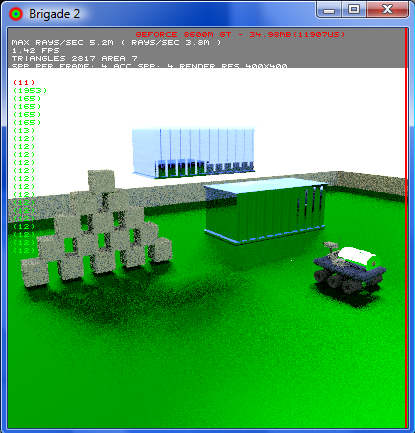 Another test with the Brigade 2 path tracer: this time I've added a user-controllable vehicle (included in Brigade) to the scene from the previous post. 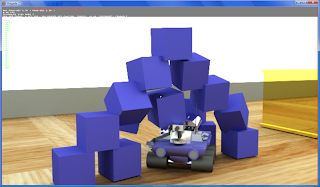 The truck consists of 1953 triangles and uses a dynamic BVH which is updated (BVH refitting as there are only translations and rotations) every frame when the truck moves. I've made a very simple real-time, interactive Bullet physics simulation of a bouncing light-emitting cube, rendered using the Brigade 2 path tracer with 8 spp per frame on a low-end GTS 450 (render resolution is 320x240 to keep the framerate acceptable). The simulation can be paused and resumed and the image converges when nothing moves. The scene contains 12733 triangles. "This is some early footage from the student game "It's About Time", created by students of the IGAD program of the NHTV university of applied sciences, Breda, The Netherlands. 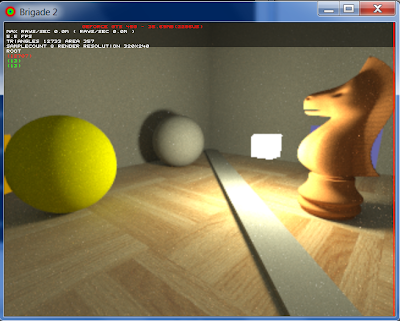 This game uses the Brigade 2 path tracer for rendering. Although this results in a noisy image, the lighting is very realistic. A proof-of-concept demo of the game will be ready in January 2012. After that, the team intends to continue working on the project until the end of the academic year." The lighting in the video is of the same quality as a precomputed lightmap, but is completely real-time. Obviously there is still some noise, most visible in indirectly lit parts of the scene, but I personally think it adds a special touch to the image, while at the same time attesting to the "real-timeness" of the lighting. The Brigade engine will truly shine when moving objects and animated characters will be added, which will both receive and radiate the same "perfect" physically based lighting as their environments. Moreover, this scene is just showing diffuse materials, but Brigade 2 can handle materials such as glass (with physically based light attenuation according to Beer's law), glossy (Blinn shader) and perfectly specular effortlessly, as proven in the videos in this post. In the image below, notice the indirect lighting with brownish color bleeding under the wooden roof. While it's great to see that some games are finally implementing real-time GI approximations, they are still hacks that start to break when mirrors, glass and highly glossy objects are added to the scene. Real-time path tracing solves all these issues in one breath. While the performance on one current high-end GPU is still not sufficient, very nice looking real-time path traced prototypes (with animation) are already possible, giving a glimpse of where game graphics are headed when GPU clusters in the cloud come into play. Right now, I'm busy working on some Brigade 2 powered real-time demo's (with Bullet physics) which I hope to show very soon.